This is my first wordless Wednesday post and it was inspired by one of my fellow D bloggers a1-Conceive! In her post “The day I lost it at the grocery store…”, she mentioned how us D ladies usually have to carry huge bags so huge that in fact they resemble Mary Poppin’s bag in size. 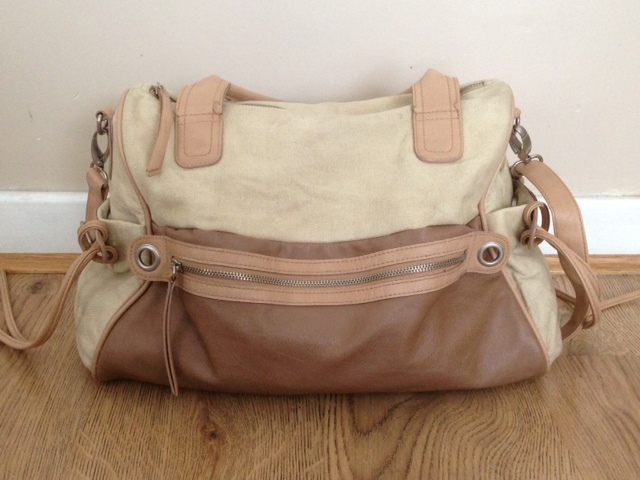 So the pictures below show my MP bag today and its content. 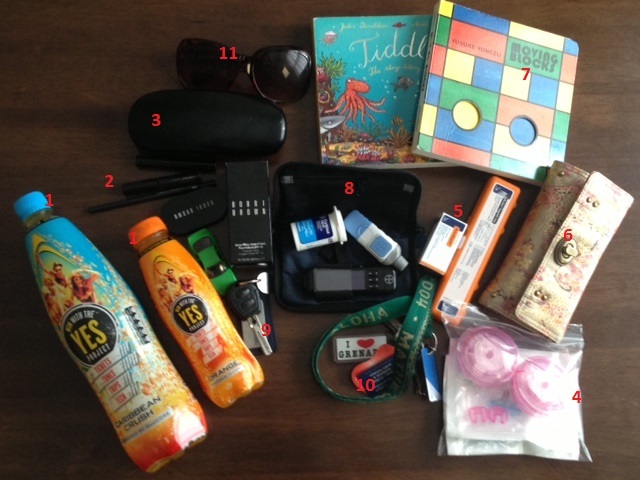 1)Lucozade 2) Makeup 3)Glasses 4) Inserts and syringes 5) Novorapid Insulin and Glucagon 6) Purse 7) Peanut boys books 8)Blood glucose machine 9) Car Keys 10) Key chain 11) ohhh and the little green car that belongs to my peanut boy. Where did you get your purse? Love your blog by the way!!! Aw thank you. I got my back from a shop called Warehouse. this week i went on a trip with just my non-D son. i intentionally carried a purse about the size of a zip-loc sandwich bag. i missed my giant bag. books, cloth grocery bags, little purchases, ears of corn…it’s bottomless. I love how you keep the kid-stuff in there; it ranks just as high in importance as all the rest! Oh yes it certainly does! Not having the books or cars in the bag could mean the peanut boy is bored. Lately he needs a lot of more entertaining. I usually have crayons, colouring books and sticker books too, to keep him occupied hahaha. It would be interesting to see what the guys carry with them when they venture out. What a cute purse. I love all the books and toys from the little one. Great post! My bag isn’t that big but I feel like it’s a bottomless sea of crap. And I can never find what I’m looking for! Hahahaa I must admit I do have bigger ones. It really depends on the day. LOL Shame!